MARUQ Shop Staff: MARUQ Hair Styling Event! We're having a Hair Styling Event on Saturday, June 15th from 12:00 pm to 6:30 pm. 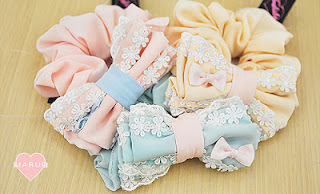 When you purchase a Liz Lisa or Tralala hair accessories, we will style your hair at no extra charge on the event day! We are currently taking reservations for hair styling so please sign up before we run out of time slots! To make a reservation, please sign up and reserve on our Setmore page. BOOK HERE. Take a photo of your hair styled during our event and upload it on facebook. Tag us @MARUQ. We will be giving out prizes for the photos that gets the most likes by June 22nd! Those scrunchies are so cute! How much are they?